This grand RR project was the predecessor of the Southern Pacific Co.'s New Orleans to the Pacific “Sunset Route”, a feat of almost thirty years' work, completed January 23, 1883. The NOO&GW was chartered in 1853 (La. Legisl. Act 149 of 4/22/1853) and immediately began building from Algiers, having completed surveying a year before. New Orleans raised a million dollars by taxes and the U. S. Congress granted lands, a 12 mile wide pathway, six miles from the center of the road's track, each side. The possibility that passenger cars came from Barney & Smith (Dayton) in 1853 opens a view of pre-Civil War intercity transportation that is quite fascinating. The online encyclopedia Wikipedia gives a lengthy history of the Miami & Erie Canal, which was completed in 1845 and operated for 68 years. Its route was from Cincinnati to Toledo. Thus “inland” water transportation was feasible from New York City, via the Hudson River and the Erie Canal to Lake Erie at Buffalo, across Lake Erie to Toledo, thence via canal to Cincinnati and the Ohio and Mississippi Rivers, to New Orleans. 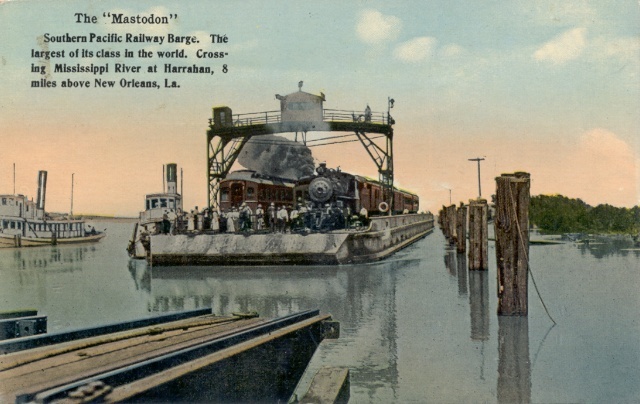 The passenger cars for both the New Orleans Opelousas & Great Western and the New Orleans Jackson & Great Northern Railroads could have come that way from Dayton, secured to the decks of barges, with trucks alongside in the same shipment; upon unloading, the cars could be set upon trucks immediately, ready for service. The Stephenson streetcars for the New Orleans City RR, in 1861, did come by river to New Orleans (the cars temporarily held by Federal authorities at Louisville, which see) and easily could could have made the whole trip from the New York City carbuilder by this interesting inland water route. A 1901 map showing the canal, along with electric interurban lines in service, under construction, and projected, has the corporate title “Maumee and Erie Canal Transp'n Co.” (Columbus, Delaware & Marion Elec. RR Co. first mortgage 5% gold 20 year bond listing, in Louis Hennick collection). The canal was not a financial success and surely experienced corporate reorganization periodically, but did contribute to the work of building railroads and city railway lines by delivering new equipment. Construction was an unceasing series of obstacles, mainly due to water soaked surface soil that required thousands of heavy wooden pilings and many bridges. In 1857 80 miles were in operation, to Berwicks Bay (DP 4/12/1857). Docks were built there to transfer freight between trains and ships, cutting days off shipping times, eliminating the long water route to New Orleans via the Mississippi River. One of the chief investors and driving force behind the NOO&GW was a shipping magnate named Charles Morgan (no close kinship with the renowned John Pierpont Morgan, banker and financier in New York, who became notorious after the Civil War). Charles Morgan operated a fleet of ships in the Gulf and the Atlantic, and himself had a New York business address. His steamships expanded to the Pacific, thanks to the Panama Railroad. The Civil War saw the NOO&GW taken over by the United States Military Railroads, an arm of the U. S. Army. When the USMR took over, on May 1, 1862 (Dunscomb), the NOO&GW had 12 locos, 12 passenger cars, 5 baggage cars, 2 express cars, and 209 freight cars. The RR was returned to its owners on February 1, 1866 in terrible condition, mainly from repeated floods and inadequate maintenance. Business revival was not sufficient, and the railroad faced the inevitable: foreclosure and sale to satisfy creditors (SS 5/25/1869). The new owner was Charles Morgan, who purchased the drooping railroad at public auction on July 31, 1869 (or May 25, 1869 (SS) — exact date difficult to establish due to records damaged by hurricane Katrina). Morgan didn't change the road's title for 9 years. People referred to it as “Morgan's Louisiana & Texas RR and Steamship Co.” That very title was made official by charter of April 1, 1878 (Dunscomb). The railroad was virtually 100% rebuilt (and regauged to standard) between June 1872 and May 1875. It is disappointing to lack more complete descriptions of the rolling stock of this and most other steam suburban, short line, and long distance railroads. Locomotive data is more rewarding because more railroad enthusiasts researched this area than “coaching stock.” Yet, there is almost endless and sometimes complete rosters of street railways! 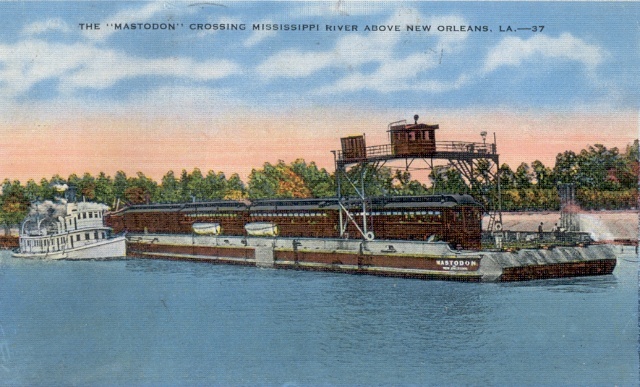 The “Sunset Route” trains crossed the Mississippi River on the huge car ferry “Mastodon”. It crossed from Avondale on the West Bank to Harahan on the East Bank. Trains used joint trackage with the IC/Y&MV. It took hardly a half hour to break up a train, spot it on the ferry, pull it off on the other bank, make it up, and head for the station. One of the more spectacular accomplishments of Louisiana's populist-progressive governor Huey P. Long was the towering bridge for rail and highway traffic across the river, opened in 1935. The first New Orleans passenger station for the road was at the foot of Elysian Fields Ave. This lasted until 1903 when their trains began using the new Union Station at S. Rampart and Howard Ave. Passenger service was frequent; “local” trains allowed early arrivals and late departures, the closest to commuter trains the SP offered. Other RRs did operate such trains with steam power or gas-electric motors (Texas & Pacific, Illinois Central, the IC subsidiary Yazoo & Mississippi Valley, and the Louisville & Nashville — all of which see). The Southern Pacific's Employees Division Timetables listed subsidiaries such as Morgan's La. & Tex. RR and SS Co. on the covers, each of which named the appropriate railroad. The Morgan's and the Louisiana Western were first the Louisiana Division, then the Lafayette Div. — RR titles replaced in the 1920s by “Texas and New Orleans RR Co.” — and this arrangement finally became simply “Southern Pacific Co.” Today, it is part of one of the few “mega” railroads in the US, the “Burlington Northern Santa Fe”. The Missouri Pacific is now “Union Pacific”, the Illinois Central is allied with the Canadian National Rys., the Louisville & Nashville is now part of the “CSX System”, the Southern Ry. System is now part of the Norfolk Southern, while the GM&O has been partially abandoned and segments have been “spun off” into several diverse segments (e.g., Slidell to Bogalusa in Louisiana) in Mississippi, Tennessee, and Illinois, each with a different owner and title. Copyright © 2008, 2014, 2015, 2016 Louis C. Hennick. All rights reserved.